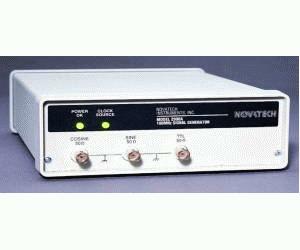 The Model 2908A is a 100MHz DDS Signal Generator in a table top instrument case. The 2908A generates Cosine, Sine and ACMOS/TTL output signals simultaneously up to 100MHz in 1μHz steps using the 1ppm internal TCXO. Built in Function Generator can be programmed for FSK and CHIRP frequency outputs. The 2908A can use an external frequency source to provide customer desired frequency range and accuracy. The 48-bit internal resolution allows fractional frequency errors of less than 1x10-12 when using an external clock input. Phase can be set with 14-bit resolution. Simple RS232 commands allow setting of all parameters, which can be saved in nonvolatile memory. Windows® software provided.